I graduated in 1998 with an English degree from Sac State. As I accepted my diploma from my professor, my little girl was there to receive my degree with me. Just 5 months along, I’d recently seen an ultrasound in which she had turned a little somersault. During graduation, I wondered if she sensed my excitement and was doing that same thing again, causing the little flutters in my stomach as I imagined what I might do with this degree and all those hours of reading Shakespeare, analyzing novels, and writing countless stories and essays. 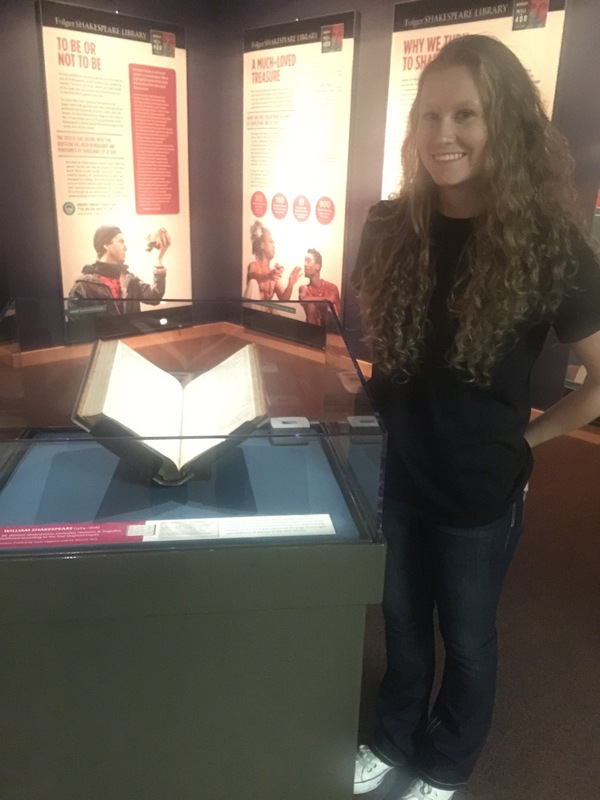 Last week, I took my little baby, now a beautiful and intelligent senior in high school, to the Folger Library exhibit of Shakespeare’s First Folio at the Wyoming State Museum. She doesn’t yet love Shakespeare as much as her English Major/Author Mom, but she does like some of his plays. Recalling the look on her face as I took her picture in front of the Folio, I think my daughter was mostly amused at my reaction. Let’s just say it was a Fan Girl moment for me. She fangirls over 5SOS while her mom fangirls over a dead poet. We both loved the exhibit though, and it was a full circle moment for me to have her there viewing and talking about the First Folio with me. Since college, I’ve become an author, but most noteably, I’ve raised my daughter. I’m telling you, friends, there ARE more important things than getting published. I went to the Folger Shakespeare Library in DC to see the Will & Jane exhibit. I have bootleg pictures–I didn’t know I wasn’t supposed to take flash photography. I took a picture of almost everything in the exhibit! lol. Need me to send you a picture of Will or Jane’s items? The guard said something to me when I went into the Elizabethan theater. he said, ” You’re allowed to take all the pictures you want in here.” I guess I looked at him oddly, then I had the “Aha!” moment and apologized. I LOVE this story! What a unique memory. You should blog about it! my friend offered to let me write a guest post on her blog. I’ll let you know if she does so you can read it.